How many of you here know the meaning of life? How many of you are searching for it? Well, I will tell you right now what it is. You, you, you- and you- are all going to die! Every single one of us in this room. It could be today, tomorrow, a year or decades from now. But the immutable fact of life is that nobody but nobody escapes death. It is the one uniting factor of all life on Earth. And since most of us rarely travel through life without experiencing the loss of a loved one, we are obviously touched at least once by the cold, merciless blade of Grimm’s sickle before we ourselves finally face the great journey. And in neither case do we know when the blade will strike. This is the eternal truth. Look deeply around you, in your life and that of others; look at Nature, a blade of grass. Nothing – absolutely nothing – is permanent and constant; death is everywhere: that’s life! What a sad comment on modern life! Death is the most natural event in the world. The moment we are born, we begin to die: we change and that is all death is – perpetual change. It is just that losing a loved one brings great changes; and of course, we enter a whole new world when we ourselves die. These changes involve all those aspects of the ego complex, which cause attachment. Indeed, without our intricate connections to all life, it is true to say that we – as an “I” – do not exist at all: literally, we are defined by our relationship to all else; and from those relationships, we establish roles arising from our perception of the personal and social interactions involved. In turn, our sense of identity is established, which feels to us as a touchstone of permanence. So of course, when we lose a loved one, quite literally, it rocks the foundations of our established world. Hence, death always brings grief in some measure. Humans have three conflicting biological responses when bereaved: there is the impulse to scream out so that the loved one might hear us and return; however, we are also vulnerable, so don’t want to draw attention to ourselves; hence, we scream silently through strangled, muted sobs. Places where we spent time with them will bring surges of grief and a renewed desire to call out: we cry. Crying also has the benefit of releasing stress hormones: emotional tears and those produced whilst chopping onions are of very different composition. The cure for grief begins in recognising, admitting and describing the loss, re-evaluating our life and finally admitting the loved one is nowhere to be found. Indeed, this is why the laying out of a body in the wake holds importance: it brings closure. One thing I think is very important to note here. Within the biological pattern of grieving, men and women grieve differently, conforming to a pattern that has been established over millennia for protection of the community. Women react more emotionally than men; they also tend to experience more loss in their lives via the direct changes that occur in losing virginity, name in marriage, the stages involved in raising children and menopause. To cry more therefore may hold important implications for a woman’s health and wellbeing and as an emotional “lightening rod” that ultimately helps maintain communal cohesion. Meanwhile, grieving men often focus more upon thinking, planning and restructuring. (And interestingly from the teens onwards, men physically produce less prolactin, which is responsible for “emotional tears” whilst men and women are wired differently with regard to verbal skills). In Nature, this might well be crucial for ensuring survival of the group and hiding its vulnerability. Modern psychiatry should therefore be challenged in its criticism of men’s so-called “lack of emotional expression;” for it’s data also comes mainly from women – who inherently tend to seek more help and be more focussed upon emotional issues than men. To criticise men for lacking emotion and women for being over-emotional are equally as insulting. Of course there are healthy and unhealthy responses to bereavement: a woman who can’t stop crying or a man who becomes emotionally constipated probably both need help. Also, we differ hormonally as individuals and therefore, in our familial and communal composition, whilst the biological pattern is for men to become more fluid emotionally as they age whilst women develop more structured approaches to coping: age balances us emotionally, which again, may well reflect our changing communal roles as we mature. The important issue for both sexes is that they have access to support and a healthy movement through the pattern. The outcome should then be positive, bringing a re-evaluation and re-affirmation of family relationships, adaptation to new roles and a new structure of relationships; this is nothing less than personal and collective evolution in which death is the great healer. Thus, there is a very sound biological principle to death, which is reflected throughout all life’s energetic levels: the perturbation of change stimulates evolution. Conversely, our alienation from death is dangerous from a biological perspective because it weakens us. Collectively, our cultural treatment of death often fails to pass the initial shock whereby we call out for the loved one; so within the context of community breakdown, we are vulnerable. The protraction of that vulnerability thus makes us neurotic with its relentless stress creating havoc on our immune systems. Crucially, our ignorance of death paralyses our personal and collective evolution, which is no less than our journey to Odin consciousness, that is, enlightenment. Many people – myself included – have noticed there is a distinctive aura of absolute silence, serenity and peace within the vicinity of death. Even in the womb, there is no silence; death is the antithesis of conception yet also its predecessor – the doorway into new life. So much about death makes it a final point of change – that is, to the ego complex we identify with: the bodily processes cease and silence emanates into the room; anything unsaid must now remain so; nothing more can be done; we just have to “be.” Silence is that deeper well of time cradled within the cyclical nature of life: indeed, death is silence. Contrast this with the incessant noise of daily activity, which keeps us marching to a daily rhythm of things to do, places to be and thoughts about the past and future. Noise and silence are like two fields that exist at different levels – floors if you like. Noise, activity, “doing” is a frequency level that feeds the ego complex: it allows us to survive and maintain our sense of identity in Midgarth; true silence is the field (or, as in our analogy, the floor below) where our ego complex ceases to act and our Higher Self reigns. At death, the ego complex and all-individual mind are left behind; for they are of a different substance to that of our litr. At this point, I must digress a little and talk about something called lamentation. To lament is to feel, show, or express grief, sorrow, or regret – to mourn deeply. A formal expression of sorrow and mourning can be seen in verse or song known as lamentation that many cultures worldwide have as part of their religious expression. The problem is that some folk use them wrongly to hold onto grudges. They whip up anger but do not allow the anger to be transformed; rather, the community fosters reactive, chaotic states, sometimes for generations. How much bitterness and resentment for instance, do we see perpetuated amongst communities in Ireland that has poisoned generations and led to so much pointless bloodshed? Used effectively, lament is healing. It questions of the gods what has happened by bringing voice to the sense of injustice, pain, grief, sorrow etc. being experienced and stops these potentially toxic emotions from becoming locked in the body as sickness and being passed into generational conflict. Whether we are talking about a community’s loss in war or a personal loss of a loved one, any or all of these emotions will be felt and need to be exorcised from the body so that healthful functioning can continue. So we can see that lamentations tell the story. Often, they are the stories of our ancestors calling for justice: justice is their right. But justice properly understood is about a return to balance and using that balance to step upwards on the ladder of consciousness so mistakes aren’t repeated. It is not about malicious and violent revenge for its own sake with no possibility of closure. It must bring healing to all- the lost ones and the bereaved alike. The death is then transformed from something apparently needless into a holy sacrifice taken by the compassionate light of enlightenment into the realm of the eternal now. The lamentations sing of the pain and call for healing – healing which occurs in the deep zone of the timeless now, the space between the waves of sound. Thus, lamentation becomes our instrument of the godforce, which is motivated by purity and compassion for all sentient creatures. To just react maliciously leaves our ancestors’ suffering in vain – hopeless victims of a senseless fate because the cycle is perpetuated. To transform that suffering is an act of power; their gift to us through death is heightened awareness, elevated consciousness and evolution for all. Compassion is one of the highest levels of consciousness that can be exhibited in this realm. It is more than emotion or interest, it is an energy – the capacity to transform all states from negative into positive and to either directly (by action) or indirectly (by prayer, meditation etc.) seek to release all sentient beings from suffering. It is a spiritual principle in action. Hence, we can see that the point of positive change in the process occurs in the realm of silence. Silence both fills and empties. In the tradition of the Romantic poets, it is a space where we are our authentic selves: our personal ego can be strengthened and vivified. Yet in the Buddhist tradition, silence is about emptying and removing the influence of the ego complex so that the space created can be filled with divine energy. Too much filling or too much emptying and all kinds of delusions can be fostered: there needs to be balance. Metaphorically speaking – and in advanced meditational practice – silence is that space between the inspirational breath of fulfilment and the letting go in expiration so that we can evolve. At that point of utter stillness, we touch the gods. It is interesting that in Qi Gong, where the middle way of balance between ultimate limit and no limit is sought, one should breathe silently so that the energies are healing and nurturing to the body: any sound reduces its efficacy. It is at this heildom between one breath and the next that we are inspired – the creative energies return to us via our inspirational breath – which transforms the emotions of anger and grief in lament to a more refined and constructive expression of the energy. Then there is a welling up into a song of hope and defiance and transformation: a new centre of order is created. Lamentation is the vehicle we use to reach the soul; and from the soul comes the healing lament, that may arise unbidden. This is Vidar’s realm, the deep primeval silence of the forests, a silence that precedes sound and an energy most pure. The soul touches the spirit and brings illumination – illumination of why things have happened, how they can be changed and the hope and energy to bring that change into being. It is a grace of the gods: we have not been abandoned. We are not hopeless, helpless victims of fate. A new song emerges: we are co-creators of our rebirth. Is there any wonder our folksongs are being denied us? Folksongs are full of laments and laments are powerful. For they evoke the eternal Disir into our midst. Incidentally, traditional laments are often led by women and this probably has to do with their historically more intimate relationship with death as explained earlier and also by virtue of their different egoic structures to that of men (which I wrote about in ORB), and which essentially, makes reference to their principle role as the cohesive force within a family and community. Effectively, a group of women leading a lament can work as a sort of “lightening rod” for the communal expression of grief, which is like a safety valve that helps transmute the emotional expression into healing so that life can continue in its new form. Indeed, lamentation can be regarded as collective psychological rebirth through the alchemy of music, verse and silence; and all birth arises via the feminine principle. Disability brings grief for our own physical loss. Sudden poverty causes economic bereavement. Redundancy or retirement brings loss of sense of identity and routine. Separations can cause us to feel bitter or like a failure. A lottery win! Amazingly, this often brings grief for the former familiar life lost. Degenerative disease e.g. Alzheimer’s disease, where the family often feel they have “lost” the former person to the disease. Mid-life crises is grief for “lost youth” and unfulfilled ambitions. Theft or lost property causes great distress through loss of the objects to which we are attached. Hopefully now, you are beginning to understand that death is not confined to the rite of passage of individual passing or that of a loved one, but rather it is a principle that we meet with constantly. So what exactly do we mean by “a principle?” A principle is an originating or actuating agency or force – a rule or law exemplified in natural phenomena. Nature is replete with principles and perhaps its greatest principle is observed through the seasonal cycles of spring, summer, autumn and winter with their predominant characteristics of birth, growth, decline and death respectively; and each season in itself is a principle: it exhibits a predominant pattern, which we observe as exemplifying that season, even though each, of course, contains the other three simultaneously. Then our mythology, as the symbolic expression of primal truth, is all about principles. So we have the legend of Balder who dies and is reborn annually at Yule. But in keeping with the law of principle that applies to all scales of observation, it also refers to the “fall” of mankind from a Golden Age of enlightenment into the darker ages of Silver, Bronze and Iron respectively where there is an increasing dominance of the ego and materialism, until at the bottom most point – the nadir – the cycle starts to head back towards a new Golden Age. This principle is common to most mythologies; for instance, Lucifer, who is so often wrongly – and deliberately – equated with Satanism by the powers that be, is actually more akin to the figure of Balder; for Lucifer means “light-bringer,” which is a far cry from the horror story imagery of Satan! Since principles apply to all levels of reality, it is true to say that as you sit here now, you are dying and being reborn in every moment. Cells are dying and new ones are being made. Within seven years, you are literally a new body because no single cell remains from seven years earlier. Every breath and every thought is a moment of death and rebirth. Breath, emotion and thought are intimately intertwined: we show this understanding when we tell an anxious person to sit down and breathe deeply to calm themselves; with calmer thoughts comes more focussed and aware action – actions that in some cases could profoundly influence their wyrd and alter their fate and that of those around them. All is connected. In any grieving process, there is a story to be told. The function of the story is for a person to lay bare the nature of the attachments involved – much like identifying the pieces of a jigsaw puzzle to see how they weave together to create the sequences and patterns with which he or she identified – patterns that have now been disturbed. The story must be heard by witnesses: this is an absolutely crucial part of the healing process. What must be communicated is the profoundly personal effect of the loss. Indeed, there is a peculiarly healing quality to the process. This aspect is the function of the ego complex: it needs to make noise, to be heard. This is not a superficial process: the listener must truly validate the experience in a quiet, non-judgemental way and provide a safe space for the person to “let go” and “let rip” so to speak, no matter how angry, bitter, selfish etc. the person might seem. However, once these raw feelings have been properly vented, it is as if the ego complex has been satisfied; it then relaxes its hold, thereby letting the rawness slip away and moving on to open the door into the field of timeless silence. Thus, space is created so the person can surrender into the well of silence, understanding , healing and regeneration. To reach enlightenment, something has to be broken up; and that something is the shadow of the ego that obscures the light of the soul. Now, our ego complex is concerned with attachment to validate itself: it identifies so strongly with objects, loved ones, roles, habits etc., that they are perceived consciously and unconsciously as being integral to its identity. And since our existence is entirely reliant upon relationships with all sentient life and even objects, any change in our relationships brings grief. But these points of change or junctures (known as bardos) are also when the possibility for liberation and enlightenment is heightened through the alchemical transformation of our conditioned egoic behaviour towards a more authentic and enlightened state of being. Ancient Vedic and Buddhist practices such as meditation, teach us to enter that place of stillness (death) so that we might make a compassionate examination of details about our life. Essentially, this involves honestly and objectively identifying attachments involving negative emotions and behaviours and working to purify ourselves. When life changes are involved or bad habits such as addictions are being healed, grief happens because healing involves the reassertion of the Higher Self over the lower self or ego complex: and grief, as we have seen, is a function of the ego complex. However, it should not be despised because it is in fact the anvil upon which our souls are wrought and so is vital to life in Midgarth. There is a very gritty metaphor in the ancient texts known as the charnel grounds. The charnel grounds was a place where people would take dead bodies to be eaten by jackals and vultures and so it provided an ideal venue for some yogis to study the entire life/death/rebirth process and the nature of impermanence. Some things are dying; some are decaying; some are being eaten; some being fed and some are being born from the very decay. Thus, they are a crossroads of life that shamelessly shows it for what it is; a crucible of suffering through the illusion of egoic attachments. So death is the merciful and compassionate alchemist helping us to see the complexities of samsara and nirvana laying buried in the great graveyard of life… Hael Kali! Look at life today: it seems the entire world laments as the nuts and bolts of existence are undone by the relentless drive of a greedy elite for power. The ceaseless noise sees birds getting louder and shriller, literally straining their voiceboxes to bursting point and uncharacteristically singing at night as they attempt to override the 24/7 din. Stress, depression, immunological problems, chronic fatigue are all becoming epidemic as people try to keep up: the only respite is a drink to unwind, medications, addictions. All measures that further enmesh the ego attachments to a material world. Looked on compassionately, the din, violence, vandalism, breakdown etc. that emerges from this sad soup of humanity can actually be seen as a desperate expression of fear, exhaustion, anger – all symptoms of grief for something missing in life. For who tells us when we have earned enough, spent enough, worked enough? Who tells us we are good enough, selfless enough, kind enough? When is the guilt and fear we endure enough? The ultimate solution is that we must face death – impermanence in all its forms. Many folk see spiritual practice as something we “do” separately from what we consider as our mundane life. In actual fact, our lives are that spiritual practice: we are all constantly experiencing the dance of life, death and rebirth. When you can see vibrant life in a cemetery and a whole world in a blade of grass, you will be on the path to Odin consciousness. When you no longer see death, you are enlightened. 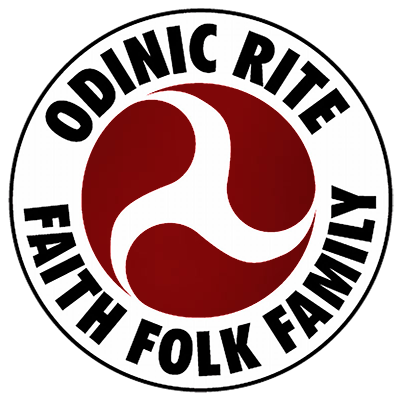 We here as Rite members are all present precisely because we have much to lament; the loss of our lands, our heritage, our due respect as a folk on the world stage. Like the mythical Balder, our folk have been cast down, oppressed into the ways of a corrupt elite, forced into a cultural mould that makes us slaves to illusion. Such is the Age of the Kali Yuga: illusion reigns supreme. But we have to travel through the Hel Realms to reach Asgard. We have to dance with death in life, merge with the silence and then arise anew as the living phoenix from its ashes. We will not be blinded by illusion. We refuse to bow down to the false gods of materialism, the minions of Loki. You know, you, you, you and you- all of us here: every single one of us in this room. We are that new man- or woman. We are the OR!